Last night we had overnight guests. It isn't what you think, we didn't have guests in the house but we had them stay overnight in our pond. It all started at dusk last night. I went out on our deck because it was warm enough and the ice from the previous days had melted. 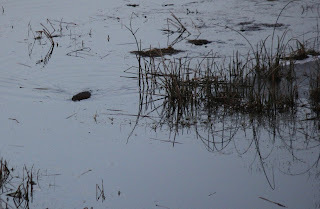 I noticed a muskrat sitting near his house. He was eating some vegetation and swimming around. The little black spot in the photo is the muskrat. Then I heard a special sound. 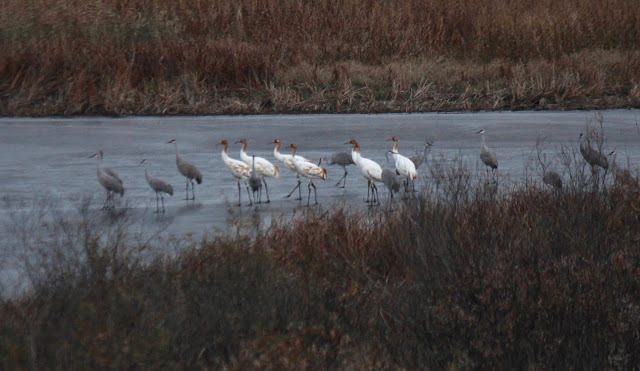 It was the sound of Whooping Cranes. 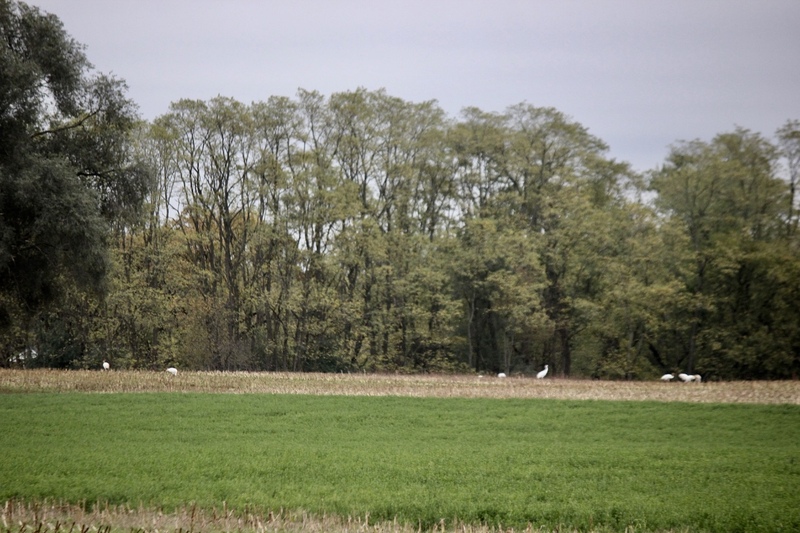 I looked around and off in the distance I saw several white birds in a field. 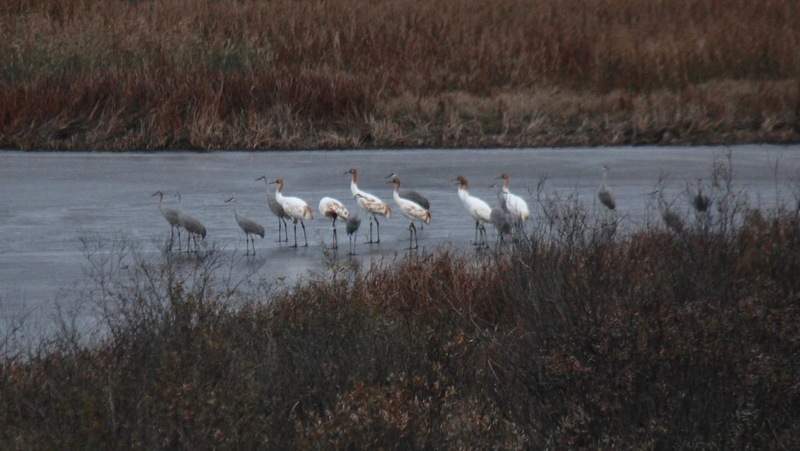 I got the binoculars and saw they were whooping cranes. I sat and watched for a while. It was getting dark, and I thought of calling my neighbor to let her know they were in view from her house. Soon I went in the house to make supper and contact my neighbor. In the time it took me to get into the house, the cranes flew over to our pond. It was so exciting. 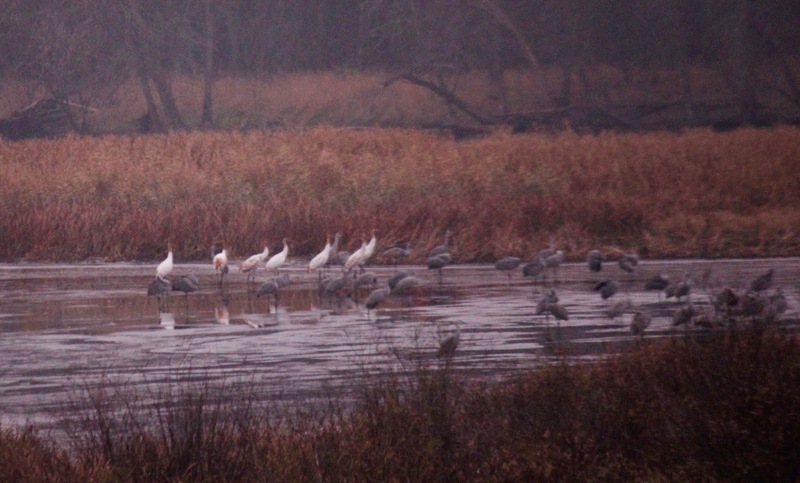 They landed in a group of Sandhill Cranes. My neighbor had already contacted me about the chicks. There were seven of them. I believe they are the same seven chicks we saw a few miles from our house earlier this fall with two adult birds. It is time for them to migrate, and I was hoping the adult birds would help them. The chicks haven't migrated before. I didn't see the adults so now I'm hoping the Sandhill Cranes will guide them. One of the adults we were hoping would help. The crane chicks liked to spend their days in a corn field and then they would return to the marsh at night. 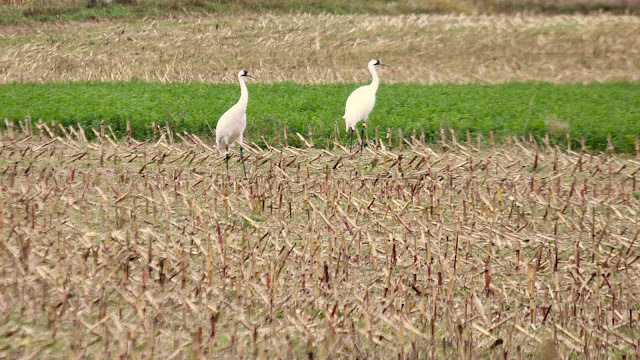 The two adult Whooping Cranes we were hoping would help with migration. Soon it was too dark to see. I was sure they were spending the night. When I got up in the morning, it was still dark. I waited until it was light enough to see across the pond. I didn't see them at first because they had moved, but then I heard them. 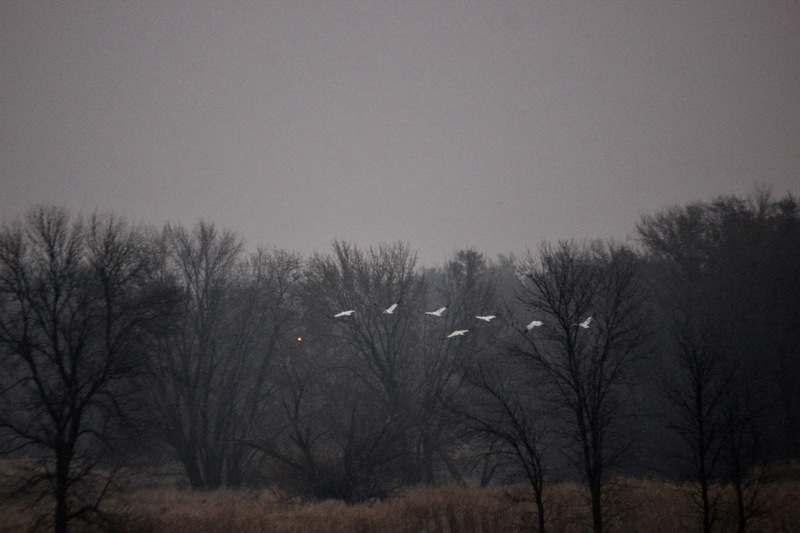 They were flapping their wings and vocalizing. 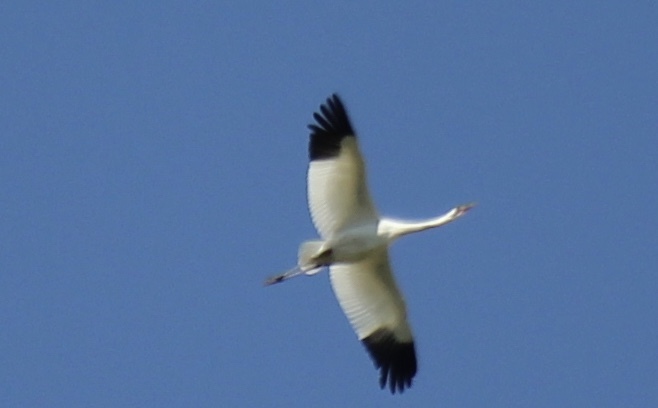 I watched for a short time and then they took off. The problem is that they went north, back to the area they spent the summer and fall. 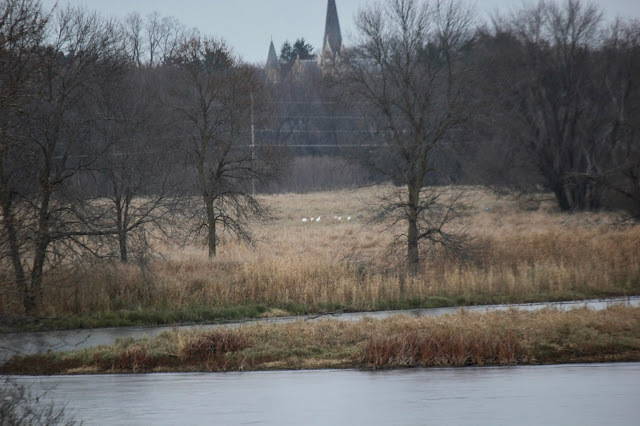 I had always hoped a Whooping Crane would land in our pond if only for a moment. To see seven of them was a dream come true. 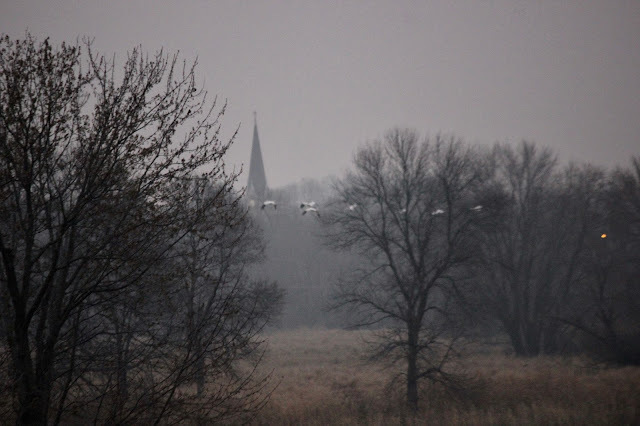 If they don't fly south today, maybe they will come again tonight. I might as well keep on dreaming.